Investors have more responsibility than ever for achieving their financial goals. Pensions are disappearing, Social Security is expected to replace less of the income a retiree earned while working, and the growth in wages has been near-stagnant for decades. As a result, workers are fending for themselves by setting up their own retirement accounts or participating in 401(k) plans offering by employers. Yet many investors lack essential knowledge about the principles of investing to make effective financial decisions. And far too many investors are lured into investment fraud by the promise of huge returns with little risk. The State Securities Board’s For Investors section was assembled to help investors of different ages, economic status, and financial goals invest wisely. No jargon, no nonsense: The Texas Investor Guide explains the time-tested principles of investing and shows you the tools you need to research financial professionals and avoid fraud. 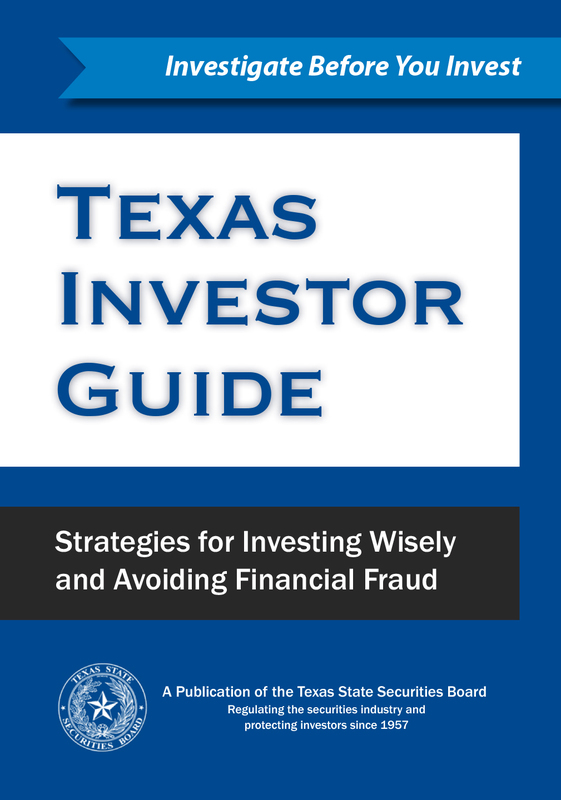 You can read the Investor Guide online, or you can request print copies by emailing Robert Elder, Director of Communications & Investor Education, at relder@ssb.texas.gov. The Investor Guide is also available in Spanish. The TSSB has found widespread fraud in investments that are supposedly tied to cryptocurrencies. Read the results of a four-week investigation into crypto offerings and ongoing enforcement efforts.